"Mom. Prince doesn't want to leave. Can you set the house back up so we can let him stay another night? It's kind of nice, actually, because I still have one butterfly left. It was sad to see all of them go." On Mother's Day evening, as we sat on the sofa in the kitchen trying to decide what to do about dinner (after a large and delicious lunch that included this bloody mary for me at the Presidio Picnic), I heard a rustle-rustle. I looked over to the pantry, hoping desperately I was imagining things. "You guys. I heard a rustling sound. I'm worried it's a mouse. I do NOT feel like unpacking the entire pantry right now." "It's probably the butterflies, Mom. OH OH! IS IT THE BUTTERFLIES? DID THEY HATCH?" Wyatt's grandparents sent him a butterfly kit for his birthday, and the butterfly house with chrysalides was right beside me, under a little table in the corner. 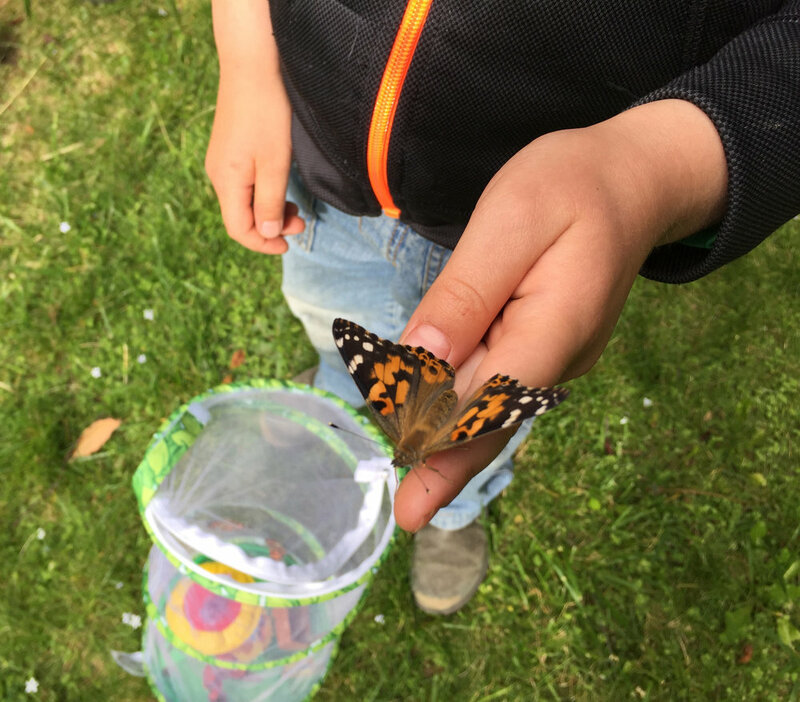 We hoisted the house out, and sure enough, two butterflies were out of their cocoons, fluttering around. Within a day, the remaining three butterflies had emerged. Today was the day we were planning to let them all go. But it was misting and raining a little bit, and Wyatt protested--it was not nice enough weather to send the butterflies off into the world. Eventually, though, when the sun emerged, he changed his mind and headed outside with them. "Mom, wouldn't it be great if we could just tie a little paper tag to their leg, that said, like, maybe, 'Josh,' so that when the butterfly flew back, we could be like, 'Hey, look! It's Josh!' Or maybe Michael?" Yes, butterflies flying around with tiny nametags on their legs would be pretty great. Four out of five butterflies eventually took flight and disappeared out of our garden. Of those, two stopped on our fingers or jeans to bid us good-bye, and the other two just flapped away furiously, as fast as they could, wanting absolutely nothing to do with us. Pretty standard butterfly behavior. The fifth butterfly, though, is oddly lovely--a little like a lap dog. The smallest and last to emerge from a cocoon, it was also the last one left in the butterfly house today. It wouldn't leave until Wyatt eventually coaxed it out. And then it flew around the garden three separate times, only to return every time to the wilted parsley stalk in Wyatt's hand. 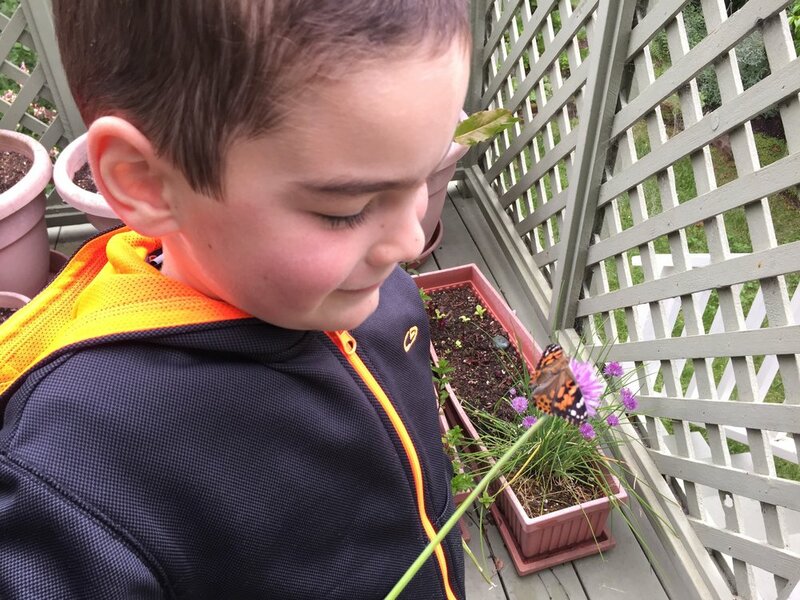 After over 40 minutes of playing with the butterfly (it was walking from Wyatt's finger to the parsley stalk, then to a chive flower, and back to the stalk , then back to Wyatt's finger, pausing with wings open, and wings closed, over and over again), Wyatt said, "I don't think Prince is going to leave today. I don't want to leave him outside. Can you set up his house and food again? Maybe he'll want to leave tomorrow. Or maybe not." How could I say no? We'll see what happens tomorrow. Prince has been very still since he came back inside. I keep checking to see if he's dead, and every time I start to unzip the top of the house, I swear he waves an antenna or a leg at me: "Not dead!" It was a great Mother's Day even before the butterflies emerged (and I learned it was not a mouse in our house). I got to read in bed in the morning, Marc and Wyatt made breakfast, then I went back and read MORE in bed. I am the proud new owner of a 16 kg kettlebell, and at school, Wyatt got to make MORE FELT BALLS for a Mother's Day felt ball necklace for me. I about died when I opened the gift. He explained he had to make five balls, everyone had to make five, but you could make more if you wanted. "WHY WOULD SOMEONE MAKE MORE THAN FIVE?" he asked incredulously. He, understandably, did the minimum. I, on the other hand, have been doing more than the minimum in the kitchen, lately. Spring vegetables! They're so welcome after a winter of frittatas made from sturdy, leafy greens. We had an amazing Salade Nicoise (The Un-Composed (i.e., Best) Niçoise Salad Recipe) the other weekend. Hooray for green beans! Make everything, including the potatoes, the way they say. They're astonishingly good! Also? These two guys are great at veggie prep. We also had a quinoa salad for days (and no one minded the leftovers, for once), inspired by one of the meals we had with our friends in Los Angeles. For the quinoa salad, soak the quinoa seeds (grains?) overnight, and then drain and cook them according to the package directions, using vegetable broth instead of water. Grill or broil asparagus, some sugar snap peas and leafed brussel sprouts, grill (or just blister the heck out of on your gas stove burner) a sweet red pepper, peel it, and then cut all the vegetables (except the brussel sprout leaves) into bite sized pieces. Toss all of the vegetables together with some chopped herbs and the quinoa. Dress with a vinaigrette, add salt and pepper. Eat warm, cold, or reheated.